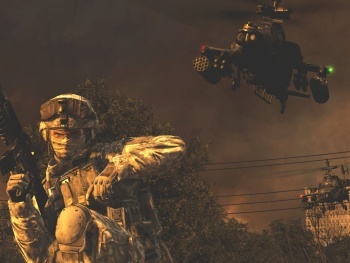 Mammoth military multiplayer, um, MFPS Modern Warfare 2 is the fastest-selling game of all time, and has just passed $1 billion in retail sales, making it still less successful than Avatar. You've heard it all before: Despite (or perhaps because of) blazing controversies in terms of the game's content and technology, Infinity Ward's Cod Mewtwo became the biggest entertainment launch in history, raking in a half-billion dollars in just one week on shelves. Naturally, such a head of steam couldn't be kept up forever, and it took slightly longer to make up the other half-billion - just under two months. But make it up it did, and today it was announced that the wildly popular FPS had taken in over a billion dollars in sales. That is an incredibly staggering number, and an extremely rare one for any form of media to ever achieve. "Call Of Duty: Modern Warfare 2 has exceeded our expectations and shattered theatrical box office and videogame records," said Activision CEO (and Gamer Public Nemesis #1 Du Jour), Bobby Kotick. "There are only a handful of entertainment properties that have ever reached the $1 billion mark, which illustrates the power of the Call Of Duty franchise and mass appeal of this game." This isn't to say that Mewtwo couldn't be more successful, of course. Why, they could always just do a crossover with Twilight! Of course, Modern Warfare 2's success looks positively puny in comparison with James Cameron's Avatar, which - despite having a significantly slower launch - is sitting pretty at $1.34 billion after last weekend, having grossed that much cash in approximately one month. Sorry, Bobby. Guess you can't win 'em all.